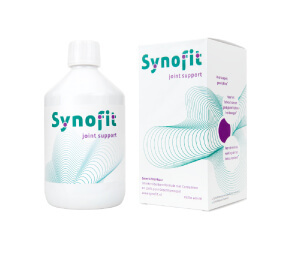 Synofit: the safe alternative for maximum joint support! New formulation with Curcumin and Green-lipped mussel: A revolutionary breakthrough to help maintain joint health. Your experience up to now may have been that natural supplements such as Glucosamine and Chondroitin Sulphate do not always provide the desired results and your joints are still not flexible. 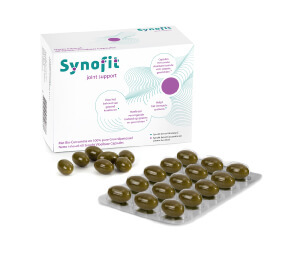 Synofit is a new promising product to help maintain joint health providing an effective formulation of Curcumin with 100% pure Green-lipped mussel. Regardless of your age: limber, flexible and strong joints play a very important role in determining your quality of life. As you get older, or if you are a fitness fan, the continuous workload on your joints means that they will sometimes need extra care and support. Synofit’s joint formula with 100% pure Green-lipped mussel (GLMax®) and Bio-Curcumin (BCM-95®) will help you to enjoy life to the full! Your experience up to now may have been that natural supplements such as Glucosamine and Chondroitin Sulphate do not always provide the desired results. Synofit is a new promising product for joint complaints providing an effective formulation of Bio-Curcumin (BCM-95®) with 100% pure Green-lipped mussel (GLMax®). Synofit is the only liquid formula based on Bio-Curcumin (BCM-95®), 100% pure Green-lipped mussel (GLMax®), and Ribes nigrum leaves that is available on the market as a complete joint formula. Furthermore, Synofit contains Calcium and the Vitamins C and D3. Synofit is the only liquid formula based on Curcumin and 100% pure Green-lipped mussel that is available on the market as a complete joint formula; other ingredients are: Blackcurrant leaves, Calcium and the Vitamins C and D3. The liquid formula originates from the horse-racing sector, where strain on joints is significant, and has been further developed by a veterinarian over the course of ten years. Synofit was adjusted for human consumption and introduced in The Netherlands in 2010. Synofit is seen as the absolute breakthrough to maintain joint health. Only Synofit has successfully been able to make 100% pure Green-lipped mussel into a liquid formula (GLMax®); no powders, extracts or oils are used, so all the ingredients in Synofit are present in their natural interaction. The quality and bioactivity of the Omega-3 fatty acids in Synofit is far greater than other Omega-3 products, with lower quality fish oil or which are based just on EPA and DHA; the Green-lipped mussel in Synofit contains EPA and DHA, but also ALA, SDA, ETE, DTA, DPA and the rare ETA. The liquid formula allows Synofit to be absorbed by the body quickly and efficiently. This supplement is therefore effective at relatively low dosages. Every Green-lipped mussel batch receives a declaration of health from the New Zealand Food Safety Authority (these regulations are equivalent to those of the European Union). For extra benefits, Vitamin D3 (for cartilage and bone protection), Calcium (for cartilage and bone protection), Vitamin C (for its anti-oxidant activity )and Blackcurrant leaves (for the anti-inflammatory effect ) are included in the formula as well. It is recommended to start with a daily dose of 10 ml Synofit Premium Liquid or 3 Synofit Premium Capsules for 40 days (if necessary: max. 80 days). The maintenance dose is 5 ml Synofit Premium Liquid or 1-2 Synofit Premium Capsules daily. What can Synofit do for me? And Synofit has no side effects. Read more about the ingredients of Synofit.